...there is a baby in a manger. A baby born to die. Today in Psalm 22 we find a Psalm of David that begins with an agonizingly painful scene. Someone who knows God and trusts in Him has been forsaken and is crying out in agony. My friend, the only One to ever experience this painful kind of agony was Jesus Christ. He knew God. He was God...born in the flesh of a tiny baby over 2,000 years ago. Jesus Christ came as a baby born to die. He lived a perfect, sinless life fulfilling all the requirements of the Law so that He could be the perfect sacrifice for sin that God required. You and I could never fulfill the requirements needed to restore our broken relationship with God. God knew this. God loved the world so much that He sent His only begotten Son, full of grace and truth, to die for my sins and for your sins. Have you accepted the free gift of salvation and of eternal life? You can today, my friend. Call on the name of Jesus Christ, admit that you are a sinner in need of His forgiveness, believe that He died on the cross for your sins, that He rose from the grave on the third day defeating sin, death, and Satan; and that He is alive in Heaven now. In the midst of all your celebrations, don't forget about the baby in the manger. The baby born to die. I love this song by Bebo Norman, "Born to Die"! Listen and worship Jesus, our King who chose to be a baby born to die...for you and for me. Today is the final day of Session 1 of Reading Through the Bible! For those of you who have been on this journey with me since we began in August - thank you! We have read through Esther, 1 and 2 Peter; 1, 2, and 3 John; Jude, Genesis and part of the Psalms. WhooHoo!! We will resume Reading Through the Bible on January 5, 2015 in the book of Exodus. At that time, my Blogging Through the Bible posts will continue. I hope you will join me then! Scripture: Psalm 21:1-2 O Lord, in your strength the king rejoices, and in your salvation how greatly he exults! You have given him his heart's desire and have not withheld the request of his lips. Observations: David is rejoicing in the strength of God and in His salvation in the battle David and his people had prayed for in Psalm 20. The victory they had prayed for seems to have been answered. Here in this Psalm, David is thanking God for the victory and for answered prayer. Prayer: Heavenly Father, thank You for all of the times You have answered my prayers. You have been so faithful to me and my family over the years. Thank You for showing me that You love me even if what I pray for does not come to pass. Today’s study has shown me many reasons why some prayers may go unanswered. May I be sure to take the time to examine myself according to Your Word concerning prayer to make sure there is nothing in my heart or life that is causing my prayers to go unanswered. My heart rejoices in Your strength and in Your salvation through Jesus Christ. It is in His saving name that I pray. Amen! Scripture: Psalm 22:1 My God, My God, why have You forsaken Me? Why are You so far from helping Me, And from the words of My groaning? Observations: What a painful beginning to this Psalm! Someone who knows and trusts in God has been forsaken and is crying out in agony. We know from Matthew 27:46 that it was Jesus who cried out these words “My God, My God, why have You forsaken me” in agony as He hung and died on the cross for our sins. Application: In the midst of all the last minute preparations for Christmas which is only 6 days away, may we not forget the true meaning of why we celebrate. 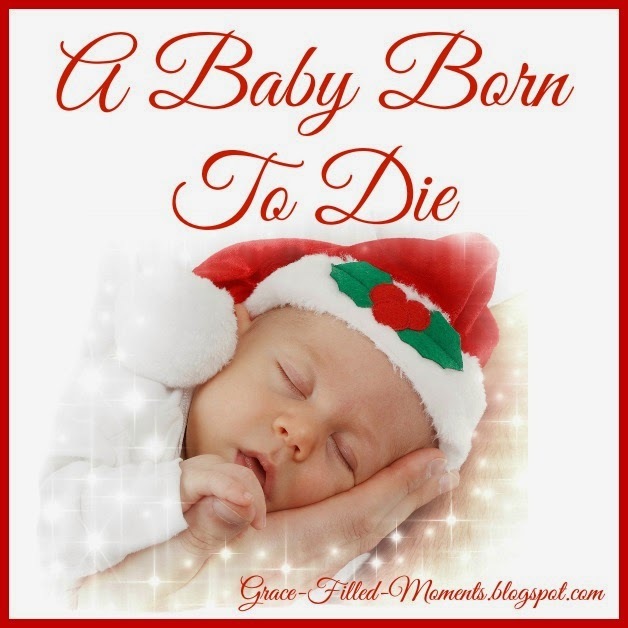 A baby born to die to for us – Jesus Christ. Prayer: Heavenly Father, thank You for the precious gift of Your Son, Jesus Christ. Over 2,000 years ago You loved the world so much that You sent Him as a baby born to die for all sinners, including me. Thank You for loving me so much that You provided a perfect sacrifice for my sins so that my broken relationship with You could be restored. Thank You, Jesus, for willingly laying down Your sinless life, for taking on all of our sins, and for dying on the cross. I love You and I praise You! May we all take time to focus on Your birth, Your life, and the beauty of Your sacrifice on our behalf as we celebrate Christmas. In Your life-giving name I pray. Amen! To all my readers here at Grace-Filled-Moments, I want to take this opportunity to say Merry Christmas! I appreciate your faithfulness and look forward to reading God's Word with you in 2015! Love and prayers for you all! Hi Laurie! I look forward to reading your blog! I just subscribed to it in Bloglovin! Merry Christmas!